← What Would You Say to the HONY Guy? My birthday was last week. I always try and celebrate by taking the day off work and doing whatever I feel like. 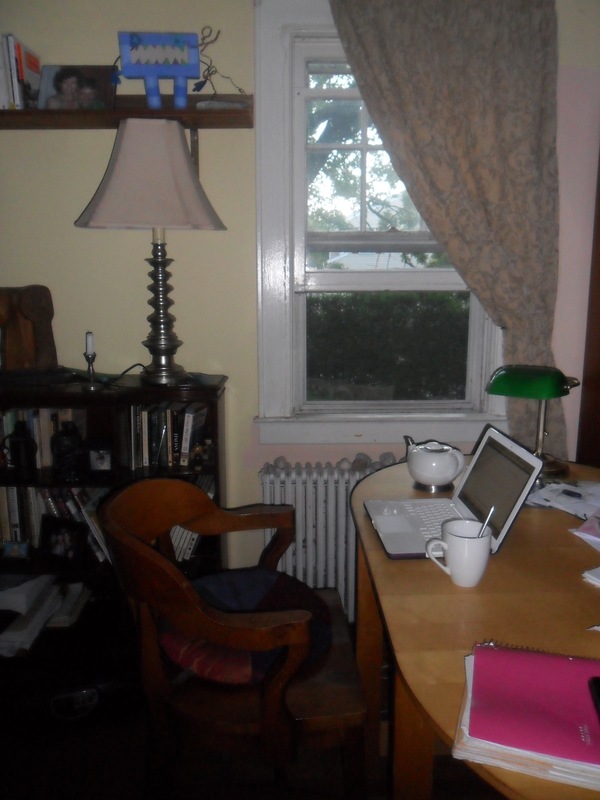 But for dodging icy rain drops on the way to a morning yoga class and later, delicious dinner out, I stayed inside, sitting here, in the little room off of Molly’s bedroom, that in her absence, I claim as mine. I wrote, I read, I napped and spent way too much time reading Facebook posts and other people’s blogs. I made myself tea and took Tetley out when he wanted to go – although my handsome old guy is mostly content to sleep by my side. Bliss. Is this what I would do if by some miracle, I can, one day, I can not work – you know: retire? Maybe. But I’ve also been thinking a lot about traveling. Not the 10-day visits to 15 places kind of travel. More of the life-changing, where else might I live kind of travel. Partly this is financial – there are so many other places that cost so much less than here. It’s crazy how much money we need to even live ‘simply’. The car no sooner is paid off and it needs big repairs. The house always needs fixing or just requires constant ‘juice’ and electricity, oil, water bills are daunting, especially during these long, frigid winters. Add to that the cost of being hooked-up to society – telephone, internet, television. I have a good life but lived fairly close the bone and without a solid job, I would not be able to sustain all this for long. Now that my daughter edges closer to independence – meaning half-way through college, I have started to imagine what I might, like on my birthday, want to do every day. Having a kid means turning that spot of what “I want to do” over to what you need to do for your kid. I did so willingly, wanting nothing more than to make her my joyful priority. But the deal is, the kid grows up and goes out into the world and figure all this stuff out themselves. Mine will be ready soon, I’ve no doubt. So time for me to re-evaluate, to ask the question I haven’t seriously considered for 20 years: what do I want? 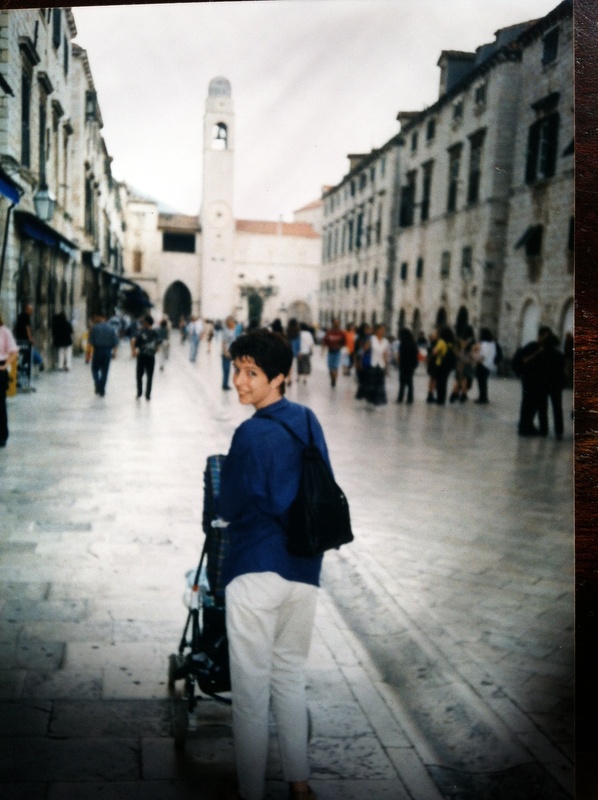 Happy mom-me in Dubrovnik 1995. When I was the age my daughter is now, all I thought I wanted to do was travel, to see the world, live other places and so, I did some of that. After hopping on a Freddie Laker special ($100? something crazy like that!) I traveled through Europe for 4 months – from Ireland as far as Greece. I think I had barely $1,000 with me – all in traveler’s checks. I wrote letters and if anyone wanted to write to me, they did so c/o American Express. I think I picked up a letter or 2 in Athens. I never called. Can you imagine? No email never mind Facebook or messaging! I remember many adventures, wonderful connections – and an almost constant ache of loneliness. First of all, I’d made the mistake of falling hard for Gerry Clancy who I met in a pub in Limerick on the first day of my trip – and after an extraordinarily romantic interlude with him, continued on. I might have stayed were he not still spinning from a recent breakup. That story deserves to be told on it’s own another time, but for now, let’s just say, I spent many Europass miles for the rest of the trip, pining. And lonely. Would have things been different if I’d been able to connect through cyber space with family, friends, lover(s)? Absolutely! Kyoto in 1985? 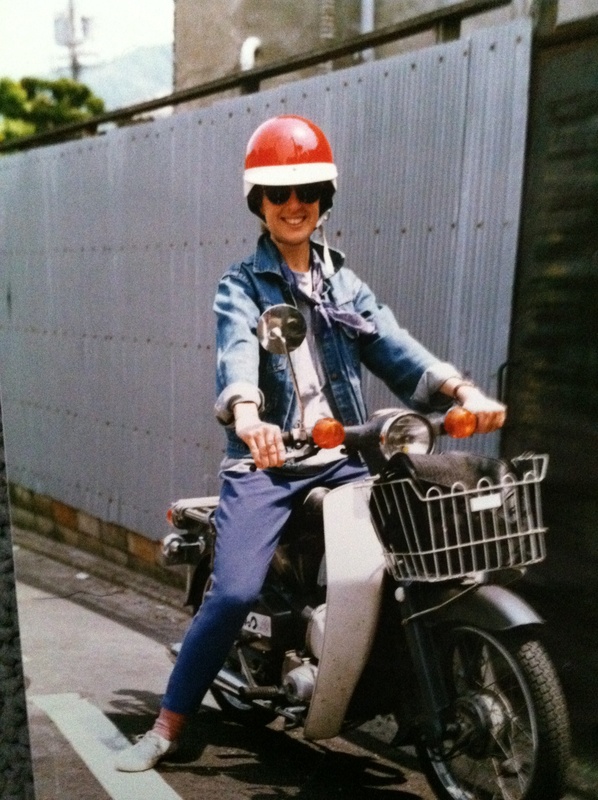 Me and my Honda Cub. I felt so cool – looked so dorky! While I look back and marvel at the richness of those days, the months of living an interior life out in the world, on my own. Really on my own with no loved ones ever really knowing where I was for long, what I was doing, hell – if I was alive – all of us just trusting in the universe. I think this set the foundation for the rest of my life – to believe I was okay in the world – anywhere. But I do think the ability to reach out and connect and sustain relationships and share images, stories, joys, sorrows, and most of all – meals, while traveling, has changed the game, the experience, to one I would enjoy even more today. I love my solitude but I love connection. I like to have hours to myself to read, walk, contemplate – but I love company, sharing my experiences with like-souls, something not always so easy to find in a strange place. 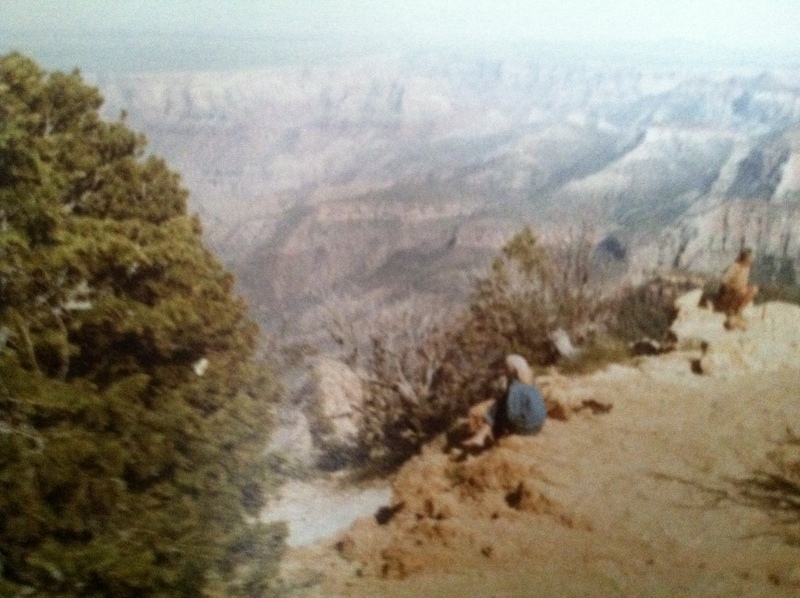 Contemplating the Grand Canyon. One of the best trips of my life – drive-away car across country with Paula & Jane, 1981. For now, I relish my life here, in almost-Spring Connecticut with a little room looking out at the oak, my dog beside me, my man in the next room both enjoying their sleep on this Sunday morning. Oh – and the New York Times delivered to my drive. I’m thinking about dinner – crockpot pulled out from a cupboard. So much stuff under there! Juicer, rice cookers, food processer, pots, pans, serving trays pulled out once a year. I’m still a long way from hitting the road. For now – I’ll dream, longingly gaze at friends photos of the cherry blossoms now in bloom in Kyoto, and check on the croci in my own garden, bravely torpedoing their way out of the frozen earth. This entry was posted in Seasonal Musings and tagged adventure, solitude, Spring, travel. Bookmark the permalink. Loved reading this, Tricia -and seeing the fab throw-back pics! Can’t wait to read your travel blog in the future – Berlin, perhaps? The world will be your oyster in a few more years (after some more college payments are made). Like a virus, once the travel bug has bit, it’s always in your system! It does look to me you’ve found a bit of paradise with your river and lovely community. As have I, when the seasons cooperate! Still… you know! Very inspiring, I was just thinking that I need a “Eat, Pray , Love” experience! I guess like u I will just have to continue dreaming for now! You are a woman who will always be able to make connections because you are warm, honest, open, and generous – travel far, but please, always swing by here to check in with your Connecticut fans and friends. Time flies, one day you’re riding a motor scooter and the next you’re paying for a house and reaching for the point where you can begin to dream about riding a scooter some place different. I hope you’re a year closer to doing something irresponsible. I took inspiration and comfort from this beautiful rumination! In happy anticipation of many years of musings and reflections to come — a belated happy (+healthy) birthday! I like traveler’s blogs too they get to see so many interesting places! It’s still on my list of things to do to travel as far and wide as I can before too much time has passed, but I definitely hear you that it’s difficult to just live simply even nowadays. Happy Belated Birthday! Happy, happy belated birthday! I love how you chose to spend your special day!! This post resonated for me in so many ways. Like you, I am interested in traveling to countries where there has not been too much change, e.g., my recent trip to Guatemala. In the future, I hope to make it to SE Asia and to Peru, Bolivia and Cuba! I enjoy traveling alone these days, wandering around with my camera, but also, I get lonely at times (especially during an evening meal). So I am grateful when I can find WiFi and connect through Facebook or my blog with friends and family back home while I am away. I smiled as I read how many years ago you traveled with almost no one knowing your whereabouts. It reminded me of last year when my son traveled to Iceland during his Spring Break. I was so nervous until he texted me that he had landed there safely!!! Such different times!! I loved your travel photos from many years ago and I so love reading your blog!!! Happy belated Birthday, Tricia. I wish you a future of grand adventures, wherever they may be. Loved your photos – especially the one of the Grand Canyon. I understand your wistfulness of long ago voyages and the loneliness. Thanks so much for mentioning my blog. Hope I can help to spark some ideas for you. English teachers are needed almost everywhere, especially places that are just opening up to the outside world. By the way, North Korea (and Iran) are on my top 5 wish list. Read that book first – Scotland would seem like a spa vacation! I’m with you on Iran though – gorgeous, exotic, smart warm people (all that I’ve net) and the FOOD! Ok, I’ll try to get a hold of it. Anyway, I’d only go for a quick 4 day trip with an organized tour. That’s the only way you can visit anyway. I thought I was following your blog, but I no longer get your posts in my WordPress Reader. I just tried to re-subscribe and it wouldn’t let me. Belated birthday wishes, Tricia! How nice that you take your birthday off from work and make it special. It was fun to see the old photos.